Of all Belgian company branches with 50 employees or more, 64 percent indicate that they make use of an ERP solution. SAP ERP is the most common package. 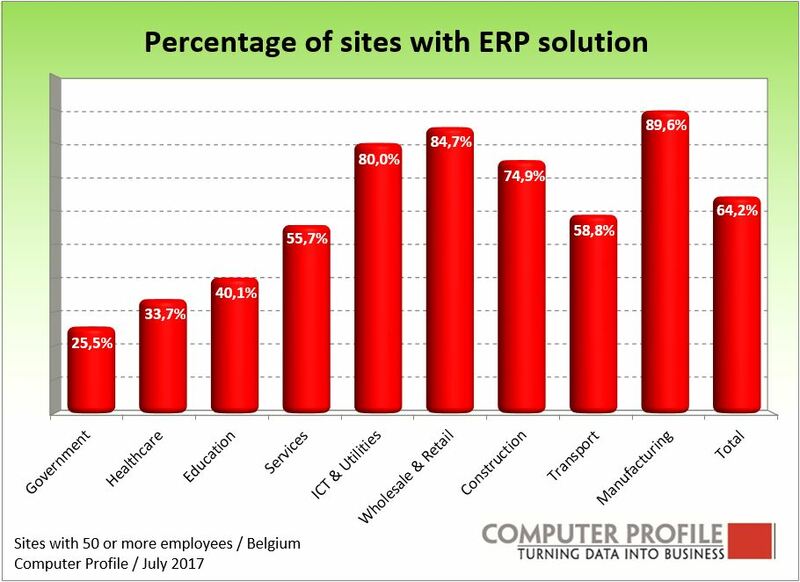 Based on all Belgian locations with 50 or more employees where ERP software is used, we see that more than half (57%) has a SAP ERP solution. Microsoft is used by around 12 percent of the Belgian locations. The third place is occupied by the category “custom software”. This includes both in-house developed customisation and customised ERP supplied by an external service provider. The variety of available ERP solutions is high. At the sites interviewed – just below 2,700 – that said they use ERP, we encounter a total of around 180 different ERP solutions. Only a limited number of these parties are found at 1 percent or more of all locations (50+ employees). Most ERP solutions still run in house. Of all the ERP packages listed, 43 percent run on a server in house. Circa 38 percent of the ERP packages run at on a server at another subsidiary or at head-office, but still within its own organisation. Around 17 percent of the ERP solutions relate to a package that is hosted in a data-center of an external service provider (including private cloud). The rest, around 2 percent, relate to public cloud solutions. The top 5 ERP applications look virtually the same for most of the identified market segments. The ERP use within the public area is limited. Within this market segment, SAP, with a share of 44 percent, is by far the largest. For locations of Multinationals, ERP use is on the other hand very high. Circa 84 percent of locations in this segment use ERP. Here too SAP is the most dominant player. Eighty percent of all ERP solutions used at Multinationals are SAP. 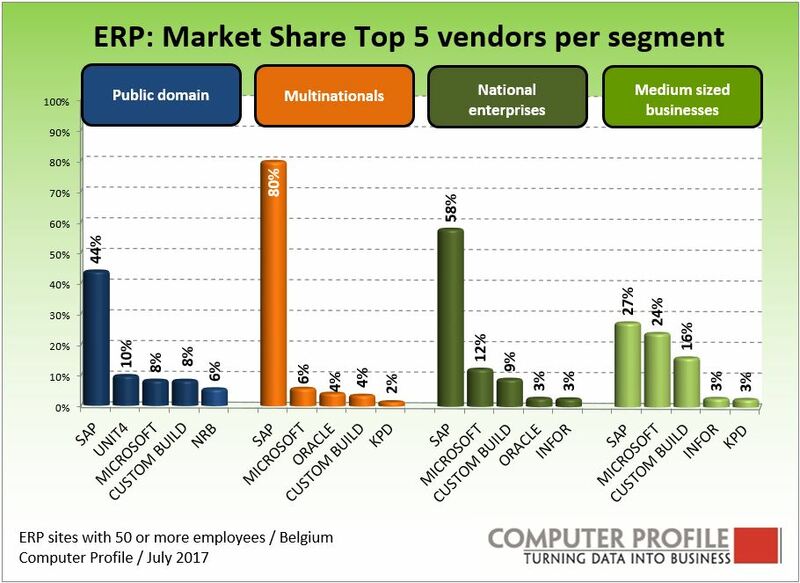 Also for locations in the “National Enterprises” market segment, which contains all companies with 250 to 2,500 employees in Belgium, SAP is the most prevalent supplier with a share of 58 percent. In this segment, Microsoft is also more clearly present. Around 12 percent of all solutions within the National Enterprises is a Dynamics ERP system. 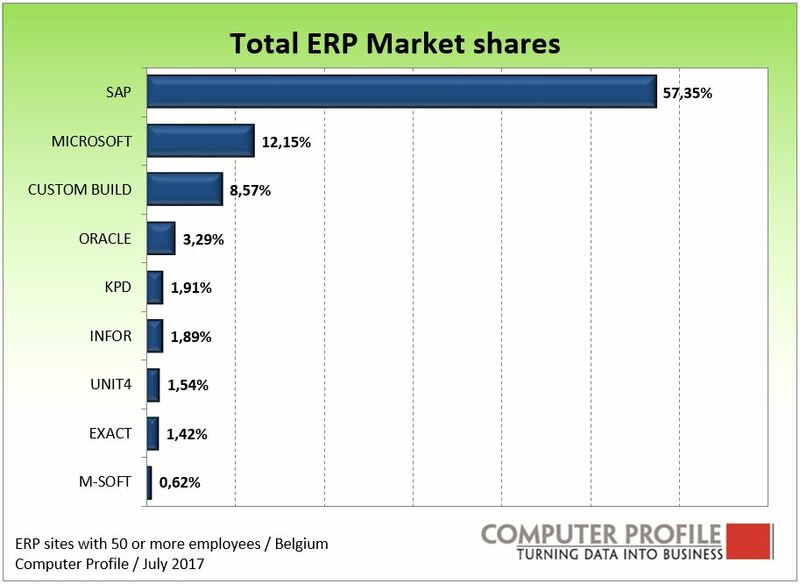 For locations in the “Medium Sized Businesses” segment, which covers companies with 50 to 250 employees in Belgium, SAP is again the leader when we look at the share within all locations with ERP systems. More than a quarter state they use SAP ERP. Custom solutions also appear prominently in this segment, with 16 percent. The growth of ERP will, for a large degree, have to come from delivering more functionality per location. The number of locations where ERP is used is, in fact, hardly growing at all. ERP use is mainly found in the profit sector. The exception in size remains the industry, where nearly 9 out of 10 locations have an ERP solution. We encounter the fewest ERP solutions (25%) among government authorities. In addition to the branch segmentation shown, a difference can also be identified in ERP use per region. In this, the ERP use is highest in Flanders. Here more than two thirds of the locations state that they have an ERP solution available. In Wallonia, this is 57 percent of the locations. In the Brussels-Capital Region, the penetration of ERP is 55 percent.